No-one ever said writing documents was easy. If you’re like a lot of people, the idea of having to put your own words to paper (or computer screen) makes you want to run and hide in the stationery cupboard. But consider this: it might not be your writing skills that are the problem. It could be your reading. The fact is, what you read matters. And it will feed directly into what – and how – you write. This is why people who work in academia tend to write in academic language. It’s one reason you might unconsciously adopt the writing style of your colleagues. And it’s why certain mistakes are perpetuated, passing from one hand to another like an alphanumeric version of the common cold. None of us is immune. In fact, I recently found myself writing ‘affect’ when I meant ‘effect’ after reading a blog in which the two words were continually confused. What’s behind this is a phenomenon called the mere-exposure effect. Put simply, the more we see something, the more familiar it becomes. And the more familiar it is, the more we are inclined to both like and trust it. Psychologist Robert Zajonc, who coined the term, tested the effect in an experiment where he placed meaningless words such as saricik, nansoma and kadirga on the front of the student newspapers at two Michigan universities. No context was given: the words just appeared one at a time in an ad space. The words were repeated over a number of weeks, with some appearing many more times than others. Finally, he asked the students about their perceptions of these nonsense words – whether they felt each word had a ‘good’ or ‘bad’ meaning. And what he found was that, overwhelmingly, people were most likely to give positive meanings to the words that had appeared more frequently. What’s more, it’s not only individual words at stake, but the order we put them all in – our grammar. A series of experiments at Bard College in New York found that participants rated sentences as more grammatical if they had simply read them before. They were also more likely to go on to use the same sentence structures themselves. So, what’s the problem here? Well, one is that the majority of us now do most of our reading (indeed, most of our everything) right here online. The democracy of the internet is a wonderful thing. Now anyone can be a published writer: all you need is a computer and an internet connection. But there’s a downside: a huge amount of what we see online has not been checked, proofread or edited. It often seems like every blog comment section eventually descends into an attack on someone’s grammar and punctuation. But, despite this apparently vehement support, even those shouting the loudest about accuracy may not be practising what they preach. And, of course, online there’s no-one hovering with a big red pen to put everything right. Or to make sure we get it right. The good news is that, as soon as you realise the power that what you read has over your writing, you can do something. In fact, it’s great news: you can begin to improve your writing just by changing what you read. So here are three tips to get you started. Have a look at news sites and online newspapers. And if you enjoy the feeling of paper between your fingers (come on, you know you do), there’s nothing wrong with picking up an actual newspaper or even a novel. Though these may seem unrelated to what you write at work, you’d be amazed at the good habits you’ll absorb by regularly reading well-edited text. It doesn’t have to be all news. Seek out high-quality blogs that you can trust to be well-written. Those that are about language are often a good place to start. As you’re already here, you could begin with our blog: we take great care to make sure what we put out is both interesting and accurate. (We’re still human, though: even we make a very occasional slip.) You could also have a look at some blogs written by our fellow language geeks, such as Sentence First, Macmillan Dictionary blog or Separated by a Common Language. As you get used to reading good-quality writing, you’ll recognise it in blogs on other topics you’re interested in. If you like what you read here, you’d be so welcome to join our mailing list to receive occasional emails with more content like this. 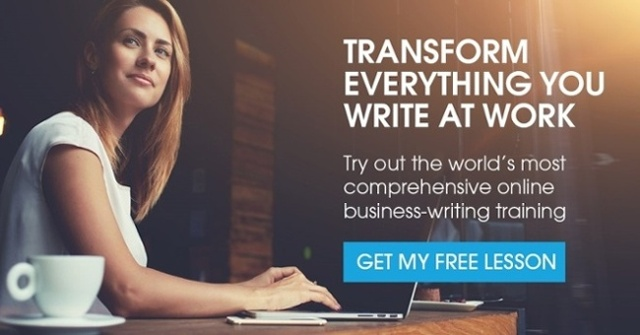 You can also download our free 64-page guide to better writing here. For everyone who does find writing daunting, it’s good to know that the future of your writing is in your hands. And quite possibly on your computer screen.